Here is Marissa is her Doc McStuffins dress! I'm pretty sure she'd never take it off. She's already asked to wear it. I'm making her wait for her birthday though! Being goofy during our photo shoot. Checking herself out in a mirror. I placed the mirror there to try to capture the light from the window, but I like how she used it during the shoot. Her smile can't get any bigger than this! 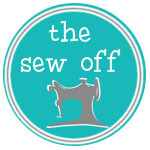 I've been wanting to start a blog for a while and I came across a sewing competition and it required a blog - so here I am!! I hope to upload the projects I've created since I received my sewing machine last August for my birthday. Until then, happy sewing!